Pease select ticket type for the area you are staying in Fuerteventura, you will be asked for accommodation details at checkout. Enjoy a fantastic day aboard our exclusive catamaran in Fuerteventura, departing only from Corralejo harbour this is a direct to harbour excursion so ideal for clients staying in Corralejo or people visiting for the day. 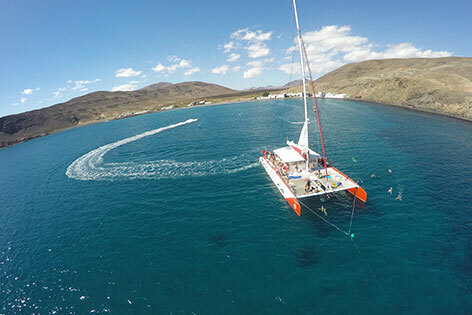 With a maximum of 12 people per departure, this is a very exclusive catamaran in Fuerteventura. Departing in the direction of Los Lobos island tides permitting. Sit back and relax on this stunning catamaran as it cuts and glides through the Atlantic Ocean making for a really relaxing day. The bar is all inclusive throughout the day so you get amazing value for money. Anchoring near the coast, you can try Snorkeling which is included and provided on the day , practice Stand up paddle, or you can simply relax on the deck of the Catamaran sunbathing and sipping a refreshing drink. Lunch is freshly prepared on the day and is a Paella and also options for vegetarians, the full day is 4 hours so making this an incredible day and they have an early sail and an afternoon sail so you have a choice. Obycat 12 person catamaran is a must do and is sheer exclusivity and an amazing price.